“Today we mark 40 years to the historic visit of Egyptian President Anwar Sadat in Jerusalem and Israel. President Sadat took a bold step, he came to the Knesset; he came to Israel. He was welcomed by the entire nation. Since then, the peace treaty with Egypt has survived despite its ups and down. Today, Egypt and Israel, as well as other countries, are on one side of the barricade in a stubborn struggle against the terror of radical Islam in its various fronts. This contributes significantly to the security of Israel. And I hope that in the future it will also contribute to the expansion of the circle of peace. “With regard to President Trump’s political plan, we heard plenty of speculations over the weekend; I am not planning to address them. I would like to say however, that my attitude towards this plan will be determined according to security and national interests of the State of Israel, and these were made clear to our American friends. History notes that Sadat recognized after heavy military and economic losses in 1967 and 1973, that most of the Egyptian public had lost interest in fighting on behalf of the Palestinians. He believed his army had regained its honor by crossing the Suez Canal in 1973, which ultimately led to his decision that the time was ripe for a dramatic overture to the Israelis. Begin’s recognition that a signed peace with Egypt was more important than Sinai — has provided Israel with 40 years of stability, by removing the military threat on its southern border. That peace has lasted through Sadat’s assassination, the removal of President Hosni Mubarak, the election of a Muslim Brotherhood government, and an effective return to military rule under current President Abdel Fattah el-Sisi. 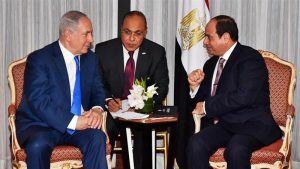 Even though the peace is cold, and Egyptian civilians almost never visit Israel, the military and intelligence cooperation between the two countries has never been more close, friendly and effective.